In physics and geometry, a catenary is the curve that an idealized hanging chain or cable assumes under its own weight when supported only at its ends. The catenary curve has a U-like shape, superficially similar in appearance to a parabolic arch, but it is not a parabola. Mathematically, the catenary curve is the graph of the hyperbolic cosine function. Catenaries and related curves are used in architecture and engineering, in the design of bridges and arches, so that forces do not result in bending moments. Each method is implemented as a separate command. All modes/commands are fully interactive, and the user is able to dynamically preview the end result on screen. 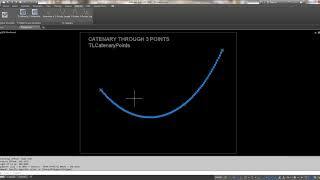 Upon completion of the command a quick report is generated with all input parameters used as well as the final mathematical equation of the particular catenary curve. The number of vertexes of the generated polyline is also adjustable within a 5-1000 points range. Осталось нить отрисовать с множественными промежуточными подвесами и будет супер!